We can all recognise that feeling of muscle fatigue after taking a brisk walk, cycling, running or playing football. Our ability to engage in physical activity for long periods of time is thanks to efficient energy production in the mitochondria—the small "powerhouses" in our muscles. The more mitochondria we have, the longer we can exert ourselves. This connection has been known for over 40 years, and today it is widely accepted that regular endurance training increases the number of mitochondria in our muscles. This is why many endurance athletes have more than twice as many of these "powerhouses" as non-athletes. "We've found that mitochondria in endurance athletes are constructed in such a way that they generate more energy than mitochondria in non-athletes. 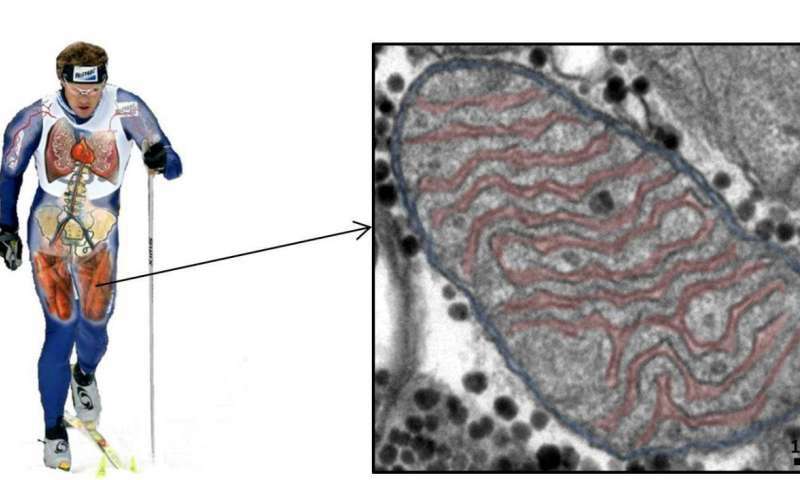 In fact, our measurements have shown us that these mitochondria can generate around 25% more energy. This gives a major advantage in endurance sports such as marathon running and cross-country skiing, but also in ball games like football", says Joachim Nielsen, assistant professor of muscle physiology at University of Southern Denmark. As part of the project, he and his colleagues have examined 15 elite athletes and compared them with 29 people who either did not exercise or were moderately active. All study subjects underwent a muscle biopsy, which was later viewed under an advanced microscope that can detect even the minutest changes in muscle structure. It is still too early to say whether the improved mitochondria in athletes are passed on at birth or whether they are a result of long-term exercise. However, Joachim Nielsen reports that the research team is now working on the hypothesis that training over longer periods of time can induce these kinds of changes in the structure of mitochondria. "We took detailed measurements of each muscle fibre and saw that those muscle fibres that are typically most active during extended periods of physical activity are also those with the most significant changes in mitochondrial structure. We see this as a clear indication that the athletes have produced these changes themselves through their training", explains Joachim Nielsen. In the long term, this new knowledge could lead to much more than just recommendations to athletes on how to train. "Now we face the task of finding out how and when these changes in the mitochondria take place as a result of exercise. This opens up perspectives that go far beyond sports and fitness", says Joachim Nielsen. "There are a number of diseases that negatively affect mitochondria and result in impaired muscle function or metabolic problems. This new knowledge can contribute to the development of new treatment options for such disease groups".